Jeppesen is the first company in the industry to have been awarded a Type II Letter of Acceptance (LOA) from the FAA for its Airport Moving Map data, which validates Jeppesen’s stringent quality standards and its data capture, maintenance and distribution processes. “This regulatory acceptance of Jeppesen's data processes demonstrates our commitment to providing data to the flight deck with the necessary levels of quality and integrity for the intended functionality in the aviation environment,” said Barry McDaniel, director, Quality and Standards. To obtain the LOA, Jeppesen complied with the requirements documented in Advisory Circular 20-153 and has passed audits in both Denver, Colo. and Neu-Isenburg, Germany. Jeppesen has been providing Airport Moving Map data to customers for over five years, as processed in compliance with the DO-200A/ED-76 standard. 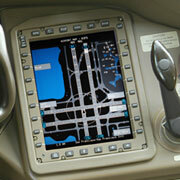 Jeppesen Airport Moving Map data is used as the foundation in a variety of front panel and electronic flight bag applications. Jeppesen was granted FAA approval for its Airport Moving Map application for Class 2 EFB devices in March 2008, and is the first and only company to have received TSO approval. Jeppesen Airport Moving Map uses a detailed database to dynamically render maps of the airport surface, and through the use of GPS technology, show pilots their position (“own-ship”) on the airport surface. The result is improved positional awareness among flight crews, which is a critical safety factor for reducing runway incursions during ground operations at busy commercial airports with complex runway and taxiway layouts. Jeppesen’s Airport Moving Map data and applications support a variety of customer airframes. For additional information call 1-800-353-2108 or (303) 328-4422, or visit our Airport Map Data page. In the Eastern Hemisphere call +49-6102-50-8180.